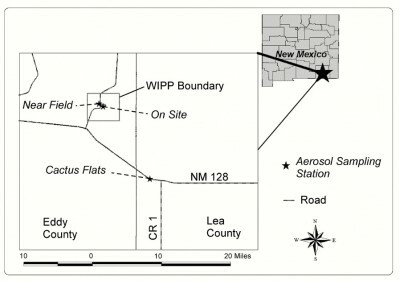 The Carlsbad Environmental Monitoring and Research Center (CEMRC) manages a network of continuously operating samplers at three locations in the vicinity of the WIPP Site to monitor radioactive constituents in the ambient air. The program is designed to detect radioactive materials in the air in case of an emergency response situation. Conducting air quality measurements is an important aspect of the CEMRC environmental monitoring program that seeks to monitor the source of radionuclides in the WIPP environment, to detect any release of radioactive materials into the environment from WIPP related activities, and to ensure the protection of human and environmental health. During the WIPP release event CEMRC air samplers detected elevated concentrations of 241Am, 239+240Pu, and 238Pu. The Hi Vol activity charts detail those readings from the start of the event on February 14, 2014. More detailed information about the Ambient Air Monitoring program is available in CEMRC’s Annual Reports. The Hi Vol Activity chart for 2014 now includes data from the restart of the 860a fan on 10-21-14.